Are Jetpods the future of commuter travel? Commuters could soon be taking flying taxis to work instead of waiting in line for a street cab, experts suggest. British developers Avcen say Jetpods would enable quick, quiet and cheap travel to and from major cities. 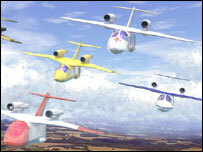 The futuristic machines will undergo proof-of-concept flight tests in 2006 and could be ready for action by 2010. As well as taxis, which would use a network of specially-built mini runways, there are military, medical and personal jet versions as well. London-based Avcen say Jetpods would be able to travel the 24 miles from Woking, Surrey, to central London in just four minutes. And because it could make so many trips, fares for a journey from Heathrow to central London could cost about £40 or £50. Unlike big passenger jets, the Jetpod would fly at no more than 500 to 750ft and would cruise at 350mph - slower than an airliner, but faster than a propeller-driven light aircraft or civilian helicopter. Each Jetpod should cost under one million US dollars (£542,388). Avcen managing director Mike Dacre said: "We see it as very much as a 'park and fly' concept. You drive to a pick-up site, get on the aircraft, and off you go. "But people shouldn't think that these things are going to be whizzing around crashing into each other. They'll be following set routes. "Jetpods are meant to be a workhorse, a taxi cab in the air, for on-demand free-roaming traffic." The craft would be able to use strips of land about 400ft long, a tenth of the length of a conventional runways. Its twin turbojets would produce up to 20 decibels less noise than the latest engines currently in service. Seating five passengers, they would also have over-wing engines, which help cut down noise. A system of nozzles that directs part of the thrust down through the wings further reduces noise, and provides the aircraft's STOL (short take-off and landing) capability. Mr Dacre said the idea was for each aircraft to fly along its own 'corridor' in and out of a city from designated pick-up points outside. "We know that cities like Moscow, Tokyo and New York are crying out for something like this, and there's nothing remotely like it around at the moment," he said. Avcen has funding available to develop and trial the aircraft, but will need further investment, The Engineer magazine reported. 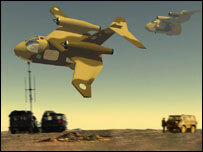 Another possible addition to the Jetpod fleet is an unmanned model designed with the ability to hover. It could be used to carry out rescues or repairs while being controlled by operators 300 miles away.